by Therese A. Rando, Ph.D. Final Passage: Sharing the Journey as this life ends. by Dale G. Larson, Ph.D.
process of becoming a kinder and genuine human being. and given days to live without chemotherapy. straight answers on how to support myself and my mother and family. expectation or fear. Chapters 13 -"Spiritual Help for the Dying"
ask forgiveness and how to create a loving and honest environment. only a few precious days left. do, admit that openly to the dying person and ask his or her help. to us what they know." all the love she had brought to us in her life. daily life - that we can learn to live and die without regret. Author: Therese A. Rando, Ph.D.
death, especially in normalizing what felt like my insanity. and dying, presents this work which is accessible to the layperson. individual through the bereavement experience. How has the book been useful to me? from reading this book and now, my residents' lives will be, too. realm of Thanatology, this book is a unique breath of fresh air. presentation. I also  liked having the press and web info included. About the  exercises in this book:  I love to write in books! Most of my college notes were scribbled in my text books. about this book and they are eager to check it out! Oh, and it's a Very Handy Size. and I definitely want to  carry this book with me everywhere! realize the basic truths of god and religions. Title: Final Passage: Sharing the Journey as this life ends. bonds connecting all of us to each other and to our Divine Source. left-- how she helps them to grieve. A good read and is very helpful. For anybody suffering from severe depression for a very long time. that somebody else has been through it and that they understand. It is important to feel understood and this book does that. I found this book on my own, in the best bookstore in my city. I bought it to read to my two sons, age 5 and 2.
ending for everything that is alive. loss of someone you love, I strongly encourage you to read this book. no other explanations for death. what VanPraagh had to say about the issue of suicide. spiritually. Ms. Landorf is a terrific Christian author and speaker. five stages of dealing with death and/or grief. Very healing book. with the lose of a loved one. in these traditions. A link to the book is contained below. music and the relaxing and trustcreating  voice of Veetman. stated that Sogyal was raised by "catholic nuns". Is this true ? If so, what evidence is there to support it ? you've lost a mother this is a book you need to read. abandonment,or incapacitation,this is the book they must read. but everything is all part of a master plan. Prof/Studies: RN. RM., Post-Grad.B.Ed and B.N.ing. Price / Pgs / Info: AUS :  $ 19. 95  ; Papeback - 186 Pages. Author 's husband died whilst she was pregnant with their only child. a place  on this site. other book on grief that I have read, manages or dares to do. or work concerned with the support of those who are bereaved. be the couse of events. around me, and for my eventual death. -- too close for comfort. I put the book away without reading it. a quotation by  Montaigne:"To practice death is to practice freedom. A man who  has leaned how to die has unlearned how to be a slave." Nuns after his family escaped Tibet during the Chinese invasion. assuming the story would revolve around dark Goth-like themes. mythos to collect and read. Heh. and good or bad, he should see what it has to offer. a big part in the story even though Lestat is the main character. The end is a bit disturbing though it contains a very repulsive part. vampires just God, the Devil, hell, and heaven. be a good read and very helpful in the completion of my second book. read and once picked up, is very difficult to put down. and  Poetry, for Meditation and the wide spectrum of Possibility. courage, spirit and poetry, all around the issues of Death & Dying. might otherwise seem to go completely unnoticed. and possibilities of being present with  someone as they die. or loved one, or for our own eventual embrace and dance with death. in bringing this message to people around the world. A great book. fear and denial of death. Price / Pgs / Info: 208 pages, Adaily guide through grief. enough information at a time and not overload you. get through this. i still go back and look at it sometimes. suffering worse by blaming the victim. those metaphors, and a liberation from them, that I dedicate this inquiry." discouraging folks from getting to the real disease and to effect treatment. set of traditional interpretations about the plague. that this study kept her sane during her own bout with cancer. up and how they feel about things as they return. A great book. Author: Dale G. Larson, Ph.D.
hospices and caregiving centers in the U.S.
price is attractively low for a very comprehensive and useful program. read big print and easy language. death and a wonderful meditation to prepare you for death. This one book truly changed my life. 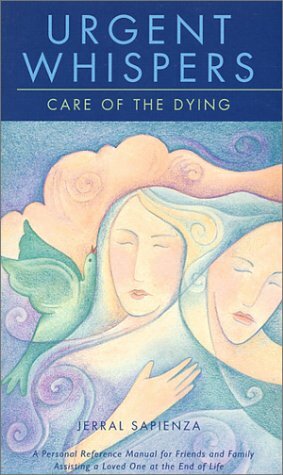 Price / Pgs / Info: US$6.95 paper / 80p / "A handbk for the Living"
being present while someone is dying. in grief over a loss.